Our Stem Cell Serum has a new look but doesn’t worry – it is the same, powerful formulation. Our state-of-the-art stem cell serum combats chronological aging by preserving existing skin stem cells. 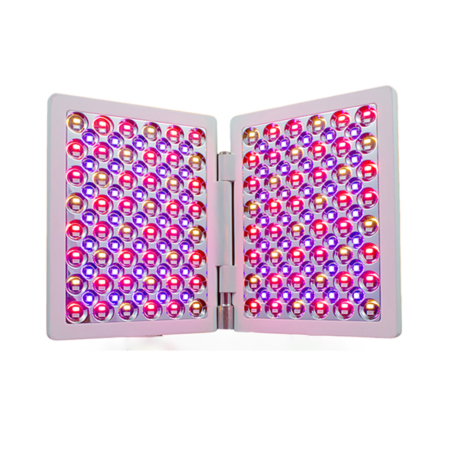 Stem cells help diminish fine lines and wrinkles, brighten and improve skin tone and texture. Our Stem Cell Serum combines Swiss apple Uttwiler Spatlaubestem (PhytoCellTech™ Malus Domestica) for smoothing, lifting, and firming the skin. Additionally, this apple stem cell serum has Pentapeptide complex wrinkle-fighter, vitamin C for skin brightening, UV protection, and hyaluronic acid for superior hydration. This peptide serum is an excellent nightly treatment for face and neck and can also be applied under the eyes and on crow’s feet. This blend is privately labeled and sold in high-end spas for over $89.00 but through my connections with the manufacturer — you pay ONLY $49.95 here – that is $40 off! Want even faster effects? Use the Stem Cell Serum in conjunction with a Micro Skin Roller. No one can beat the premium quality and affordable price of our revolutionary Stem Cell Serum formulation. 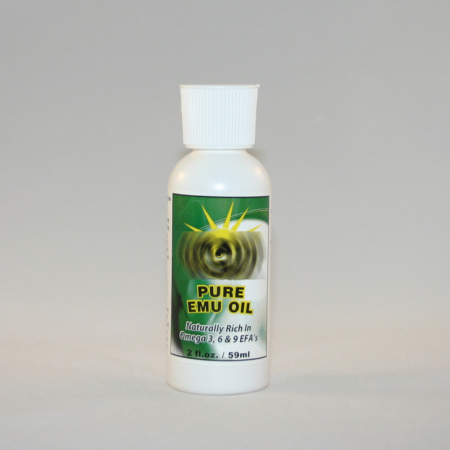 Others private label and sell our formulation for $90 – $115. Stem Cell Serum offers 3% potent stem cells from PhytoCellTech™ Malus Domestica (rare, Swiss apple Uttwiler Spatlauber) to lift and plump lines and wrinkles, and firm sagging skin. Also, Stem Cell Serum offers Pentapeptide Complex (a Botox-like wrinkle-fighter), vitamin C for skin brightening and UV protection, as well as hyaluronic acid for superior hydration of all skin types. It is an excellent age-defying night treatment for mature face and neck and can be applied under the eyes and on crow’s feet too. Some of our clients buy three bottles at a time. TIP: Stem Cell Serum can also be used with our new Micro Skin Roller to help push the stem cells further into the epidermis. See my video “How to Firm Sagging Neck and Jowls” at the bottom of this page. 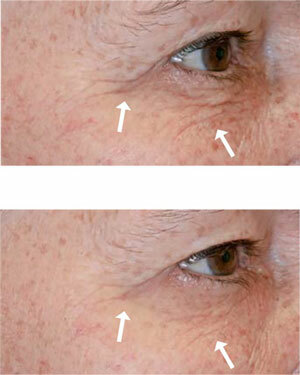 Wrinkle depth measured by PRIMOS showed a significant and visible decrease for 100% of the 20 volunteers that applied stem cell (Malus Domestica) twice daily for 28 days. We recommend this as a night treatment, however for those who also wish to apply it in the morning, we recommend using a hydrating sunscreen such as Evenly Brightening Day Crème (with 15 SPF) over the stem cell application. Apply nightly after cleansing and toning skin. Use an upward motion to apply to face and neck (focus on wrinkled areas on the forehead, nasal labial folds, mouth lines and neck folds. 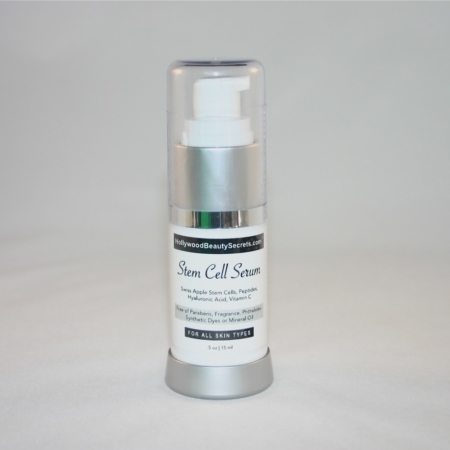 Our Stem Cell Serum can also be applied to crow’s feet and under eyes. Avoid using on eyelids. Ingredients: Water, Sodium Hyaluronate, PhytoCellTech™ Malus Domestica (Apple Stem Cells), Pentapeptide-18, Sodium Ascorbyl Phosphate (Vitamin C), Hydroxyethylcellulose, Phenoxyethanol, Ethyhexylglycerin. Tip: Use Stem Cell Serum twice a week on face and neck. 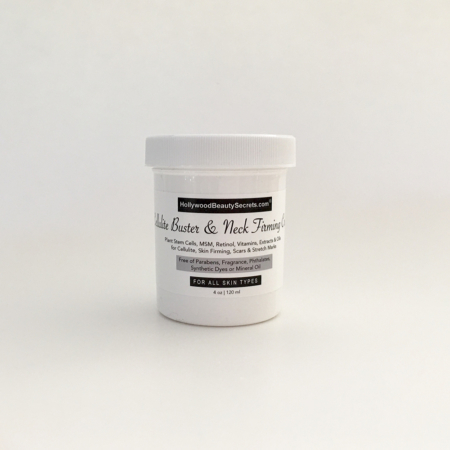 For even more efficient neck lifting, follow my easy neck and jowl lifting regimen “How to Firm Sagging Neck Skin and Jowls” with our new Micro Skin Roller. It is only $13.95. Gently glide the micro-needles of skin roller over the stem cell serum to help it penetrate even deeper into the epidermis. Watch the video below for complete instructions. Dr. Diana Tang, San Francisco, CA. I’ve been going to the top dermatologists in LA and I’ve tried many top products from Creme de Mer and other $350 creams. I don’t know how I came upon Hollywood Beauty Secrets, but thank God I did!! Somehow Louisa vets the best products for the most reasonable prices. I’ve been in heaven with all of Louisa’s choices. I can’t say more about the Skin-Lasting Super Hydrator for my body and the products for my face that I’m addicted to: Stem Cell Serum, Beyond CP, Skin Uplift Serum and Night Perfect. Btw, everywhere I go people ask me what I use on my skin, even the dermatologists!! Thanks for all the great advice and person care Louisa!!! Suraya E. Pacific Palisades, CA.